Thanks to Patrice of Life Less Ordinary for sharing this post. The Northern Rail Trail has been on my wish list for a while. Glad to hear it's worth the trip! If you're biking in the Granite State this spring, be sure to let us know all about it. J and I hit the Northern Rail Trail Saturday and it did not disappoint. Right now, there’s about 10 miles completed through Andover and just over the Franklin line, and supposedly another 25 miles between Lebanon and Danbury (but we can’t attest to that). Plus, in 2010, they are planning to connect the Andover line to Danbury and Boscawen. That would make for nearly 60 miles of rail trail! The 10-mile section we did was just great! You ride on crushed gravel through wooded areas, passing a few lakes, ponds, streams and lots of signs of the old railway. For a spring day, I was surprised that it wasn’t that crowded, but it could have been the black flies. If you just don’t take any breaks from riding, they won’t bother you! The trail is open all four seasons for multiple uses and I imagine it’s gorgeous in the fall with the colors. The rail line ran from White River Junction, Vt., to Concord from the 1840s to the 1960s. At the northern end of the 10-mile section we did, there’s an old train depot, Potter’s Place, which in itself, is pretty cool. Directions and Parking: There are 3 parking areas along this 10-mile section. We parked at the Highland Lake Inn, which is on the SE side of the trail and serves as a welcome center for the trail (has toilet facilities). There is also parking at Blackwater Park and Potter Place. Those areas actually seemed more crowded than where we parked. All of the parking areas are off Route 11 in Andover. Check out http://www.fnrt.org/ for maps and more information. 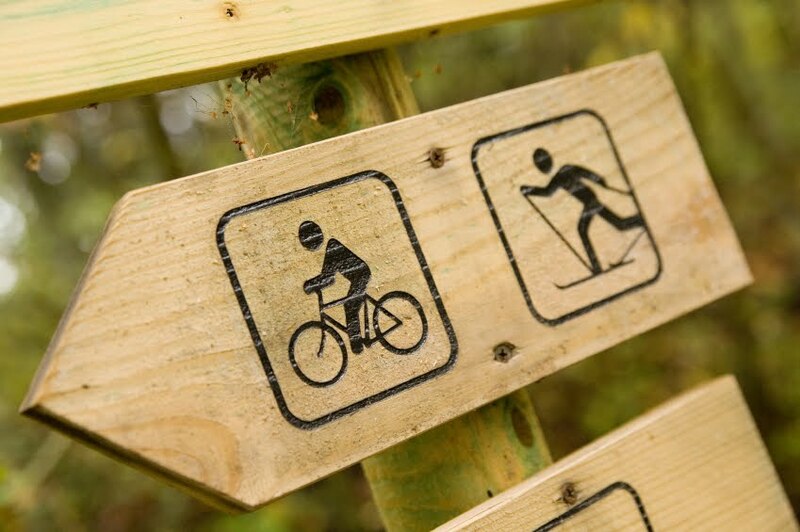 What You Need to Know: The bike path is wide in most sections, but it’s used for multiple purposes, so be conscious of bikers, walkers, runners, strollers and horses and yield-to/passing rules. The path is not paved, but the crushed stone was still smooth enough. It was not too crowded when we went on a Saturday, but I imagine it does get crowded. When you park at Highland Lake Inn, you are not at the SE terminus of the trail. It goes another 2 miles or so over the Franklin town line. Potter Place is the NW terminus of the trail. It's springtime in New Hampshire! Yes, that means lots of mud. But if you hurry, at least you'll get in some good outdoor time before black fly season. Not sure where to go and what to do? Today I'm posting links to an article on hiking and a news item about a new rail trail. Enjoy! 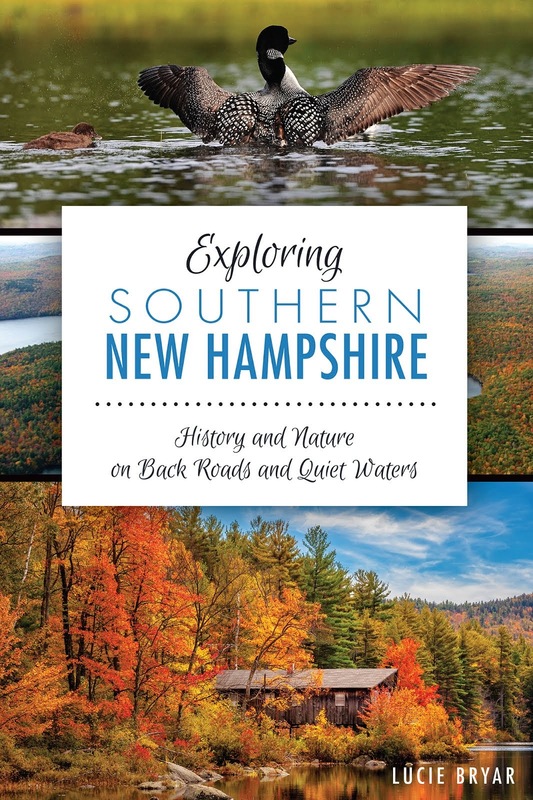 Cliff Calderwood posted this great article, Popular Walks in the New Hampshire Lakes Region on http://www.visitingnewengland.com/. I'm intrigued by the West Rattlesnake Trail on Squam Lakes (little effort and great views, according to Cliff.) Also, the Mud Pond Trail in Fox State Park (Hillborough, NH) sounds interesting. All the trails (there are six) seem do-able for the average hiker interested in exploring nature. Some of them are suitable for children, too. Thanks, Cliff! I just read about a grand opening celebration for a new rail trail in Newburyport (MA) and Salisbury NH. I can't find specifics other than the date (May 23) and time (noon to 4:00 p.m.). Also, the trail includes a water shuttle across the Merrimack River. I'll try to do more research to find out exactly where this is; in the meantime, if you have details, please write in. Kudos to the many people from Coastal Trails Coalition who likely worked years to make this happen! Anyway, here's what I like best about this annual show: there are lots of knowledgeable vendors selling equipment and accessories. 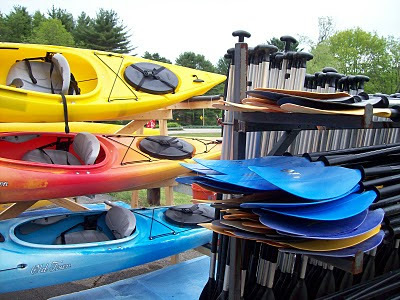 Many of them aren't so interested in making the sale, however, as they are in helping you find the right fit for your time on the water. Even more importantly, there are informative seminars and live pool demonstrations. So it's not all talk and sales pitches. Here's a brief rundown on some of the seminars. Be sure to check out the website for more details, including a coupon for $2 off the $7 admission price. The show runs for three days and many of the topics repeat each day. We're hoping to fit it into our schedule. Maybe we'll see you there! Note from Lucie: We've been very busy recently with family events -- one of them being our daughter's wedding in two months. Seems that we've had little time to get outdoors and play, but we're hoping that improves as summer approaches. What about you? Are you biking or kayaking? We'd love to hear all about it. If you've thought about submitting a guest post, please drop me a line so we can talk.